I studied at Kwantlen Polytechnic University’s Wilson School of Design for 4 years and graduated with my Bachelor of Design: Fashion and Technology. In my 4th year of my studies and after an international semester abroad, I started my final ‘thesis collection’ hetki / a moment. I always knew this ‘thesis collection’ would be much more than a final project and used it as a platform to establish my own line and later on, my own business. As of now, I am a very small start-up business and a one woman show! My fashion line focuses on the slow-fashion movement within the industry by practicing ethical production and manual labor procedures, as well as creating styles that are season-neutral, and trend-neutral so the consumer can get the most out of her clothing. Being a one woman show is actually really exciting and rewarding! I get to research, design, draft and manufacture by myself, which means I get to accurately assess quality control throughout the whole process. This also means I have to adapt very quickly based on my business’ needs and switch to understanding marketing, advertising and even accounting. It’s been one of the biggest and greatest learning experiences. A. Definitely coffee. 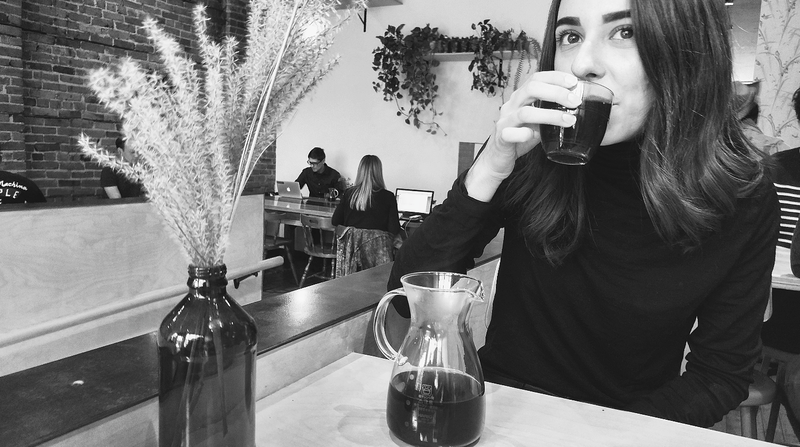 I started drinking coffee just like everyone else- mid semester of my first year in university… and never stopped. The smell of it is so comforting, and is just a good morning boost! A. Europe. I’ve spent a lot of time traveling through different European countries and just can’t get enough of it. I would definitely be headed towards the Scandinavian and Nordic countries- Denmark, Finland, Sweden. A. I have a VERY irrational fear of sharks. It’s so bad that I can’t even look at a photo of one without wanting to pass out. A. Invest. I feel like I would be weirdly mathematical and rational about it and designate amounts towards investments, savings, funding hetki and of course take my family somewhere nice on a holiday. Q. Tell us your three favourite things about being a fashion designer? 3. And getting to personally connect and meet with my customers through the design process. Q. What excites you about designing and creating a new piece of clothing? A. I’ve always felt that when I create a new piece it’s like bringing a new member into the hetki family! A lot of thought and process goes into creating a piece and a lot of production trial and error to perfect the fit and hanger appeal. So I think the most exciting part is having a final garment that I’m truly happy with that I know my customers will appreciate as well. Q. What kind of tips can you offer to any future fashion designers (like yourself)? A. Go for it. If you want to start your own line and turn it into a business, do it. I think it’s really important to start slow and steady. Be financially smart, if that means looking for grants and investors to start up, apply for them! There’s free money out there, all you have to do is find it. However, I started without a grant, or a loan, or any investors, so if that’s the route you go, just be smart with your money; don’t start creating a ton of inventory before knowing how it is going to sell. I think it’s also important to wear as many hats as possible when you start-up. This could mean being the designer, pattern drafter, the fit specialist, marketer/brander, accountant…etc. The more you take on by yourself as an emerging designer or creator, the more you will learn and this will ultimately help you understand the kind of help you need to create a better business. Also, don’t be afraid to ask for help! Q. If you could offer one piece of advice to high school Kate about grown up Kate, what would you say? A. Put yourself first and surround yourself with positive people. I definitely had a mediocre high school experience and dealt with my fair share of ‘mean girls,' experienced bullying, didn’t venture out of my ‘friend group’ to meet new people (even though I should have…) and can count on one hand the *very small* number of amazing people I’ve met and still stay in contact with to this day. So all-in-all… an average experience. I would tell “high school me” not be afraid to make new friends, meet new people, stand up for yourself, and to really realize who the ‘good people’ and ‘real friends’ are around you and focus on those people. A. “The unattainable is invariably attractive." I travelled through Germany last summer, and stopped at BMW Welt- aka BMW World and saw a beautifully lit race car, with this quote placed on the side and it just stuck.